What kind of collective idiot doesn’t like a cooperative eatery? Not me. When I want a slice of ‘za, I spin over to the cheeseboard. Queue at the register, place your order, collect your slices and drinks. 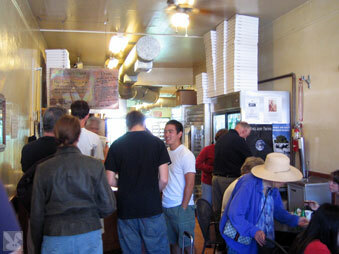 Sometimes the line is long, but the pizza is worth it. There are talented musicians performing on the piano and bass (or other instruments) while you wait in line and eat. 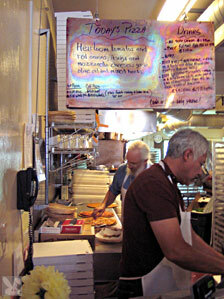 Pizza boxes line the walls of the open kitchen/dining room. There are a few tables inside and out (but not nearly enough to accommodate all the patrons.) If there isn’t a free table. go out of the restaurant and turn left (to the Cheeseboard Store) where you may find room on one of their benches or tables. There are those who ignore the posted signs and eat on the traffic median. Check out this thin crusted slice topped with thin slices of heirloom tomatoes, asiago, mozzarella, thyme, parsley and garlic. 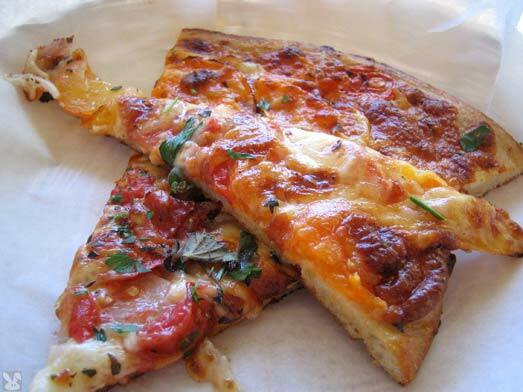 This was delicious (as usual) with a crispy/chewy crust, the correct ratio of topping to bread. Yum. Every order gets a little extra bonus sliver of pizza so nobody gets all whiney about getting a small slice. I eat my bonus first as an appetizer before digging into the big one. They serve one variety of pizza a day. If you don't like it, you're out of luck. This place started out small, but has risen to (deservedly) local legendary status. 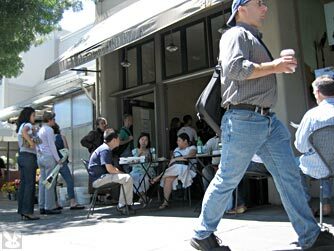 It's in Berkeley's Gormet Ghetto across the street from Chez Panisse and is a fine tasting part of the neighborhood.